Following the 3-2-1 Backup theory – 3 copies of your data: 2 stored locally, 1 stored offsite – your valuable data, including photos and documents, are protected. If a local hard drive fails, you can quickly replace it with the identical backup drive while you rebuild a new one. In the event you lose both local drives, you can rebuild new drives with your offsite backup. This insurance gives great peace of mind; but what about your computer’s operating system (OS)? If your computer’s hard drive fails, installing a new hard drive means you have to install a new OS along with your programs; Lightroom, Photoshop, and Third party plugins. Avoid this frustration by including an OS recovery plan in your 3-2-1 Backup. Here’s how to Build a Bulletproof OS Recovery plan. Both Windows and Mac computers have built-in software to create a backup of your operating system. Windows 10 uses the older Windows 7 Backup and Restore application found in the Control Panel. Mac uses Time Machine, found in System Preferences. Step 2: Select a backup location either on an external drive –direct attached storage (DAS), or on a network drive –network attached storage (NAS). Step 3: Choose the files you want to backup with your operating system. Since we are creating an operating system recovery, select “Let me choose” and deselect all check marks. We only want to backup the operating system, all other files should be included in your regular backup plan. Step 4: Schedule when you want the backup to take place. Select a time when your computer isn’t in use. Each time a backup runs, it stores another copy of the system files. This allows you to select which backup you want to restore. In the event one backup is corrupt, you have the option to choose another. Personally, I feel this is a little over kill. I choose to keep only the latest image and minimize space used. To choose to keep only the latest backup, select manage space from the backup and restore screen, click change settings then choose Keep only the latest image and minimize space used by backup. 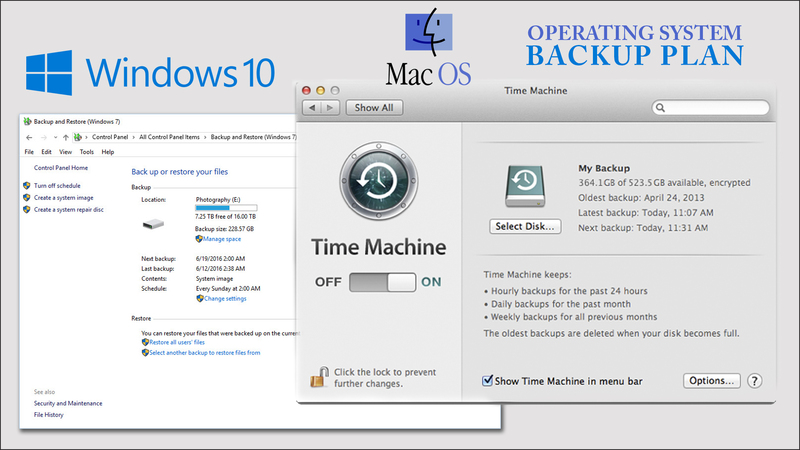 Backing up your Mac Operating System is lot easier using Time Machine. Simply turn Time Machine on, select an external or network drive and let it run. One drawback: Time Machine doesn’t have a built-in scheduler to run your backup. You can install TimeMachineScheduler to fix this. Time Machine was created to be very easy to use. In doing so, it lacks options. One missing option is to control how many backups it keeps. Time Machine will keep backing up your files until eventually it has to automatically delete the oldest backups when the volume/disk you are backing up to becomes full. This sounds worst than it really is. Fortunately there is a simple solution. select a backup drive or partition a drive that is the same size as your operating system drive. Storing your operating system’s backup on a hard drive that is included in your 3-2-1 backup plan will ensures you have 3 copies of your OS: 2 stored locally, 1 stored offsite. This “Set it and Forget it” approach will keep your data and operating system files safe and secure. Question about back ups and your 3:2:1 Plan: I have an old MacPro (Early 2008) – I know, antique – and ridiculous working with HDR and Panoramas in Photoshop and Lightroom stuff!! I was hoping for a new MacPro with Thunderbolt 3 but it looks like that won’t happen. In the meantime I’m getting close to filling up both my 4TB drive with photos and my 1TB drive with Software & OS. If I buy a 4-Bay RAID 5 device (e.g. a Pegasus 3 with Thunderbolt 3 – no USB ports) can I use an separate adapter to attach it to my current old Mac via its USB3.1 port? (I know it will be limited by the speed of USB). Then, when the next new iMAC (or Mac Pro) with Thunderbolt 3 comes out, transfer that Pegasus 3 over to its Thunderbolt 3 port? Yes you can. Another option would be a Drobo 5N attached to your 1GB ethernet adapter. The good news is you’re looking to the future for storage.